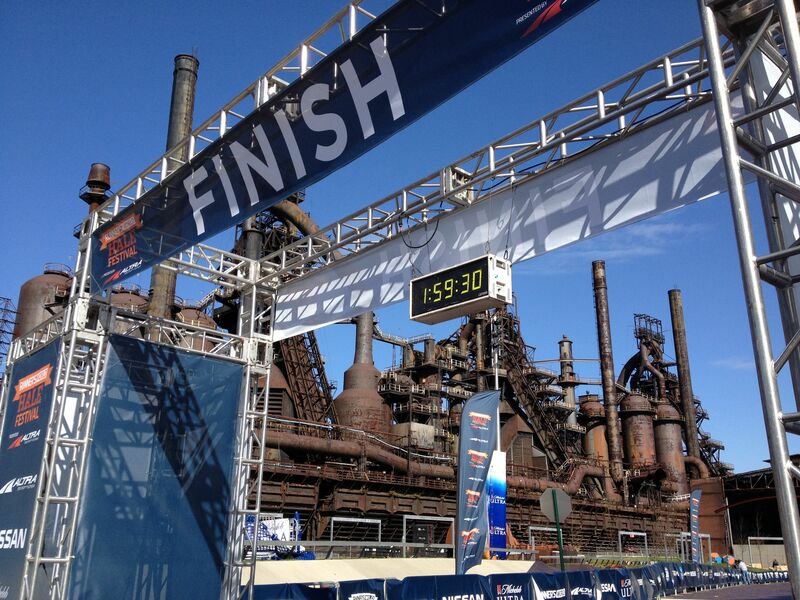 Bib pick-up was in the parking lot of the steel stacks, which was right by the very scenic start/finish line. Parking was easy and pick-up was a breeze. The tech shirts were made of recycled plastic, which is pretty cool. They had womens’ sizes instead of just having a mens’ cut. I ordered a small, since I thought it would just be an ill-fitting guys’ shirt, as is usually the case. I wish they would have specified the sizing on the registration site, but I was able to swap it out without hassle. Seeing as Bethlehem is a pretty small town, I wasn’t surprised that there weren’t a ton of vendors at the expo. I was impressed with the vendors that were there. There was a huge booth where you could run on a treadmill and get a shoe fit analysis. 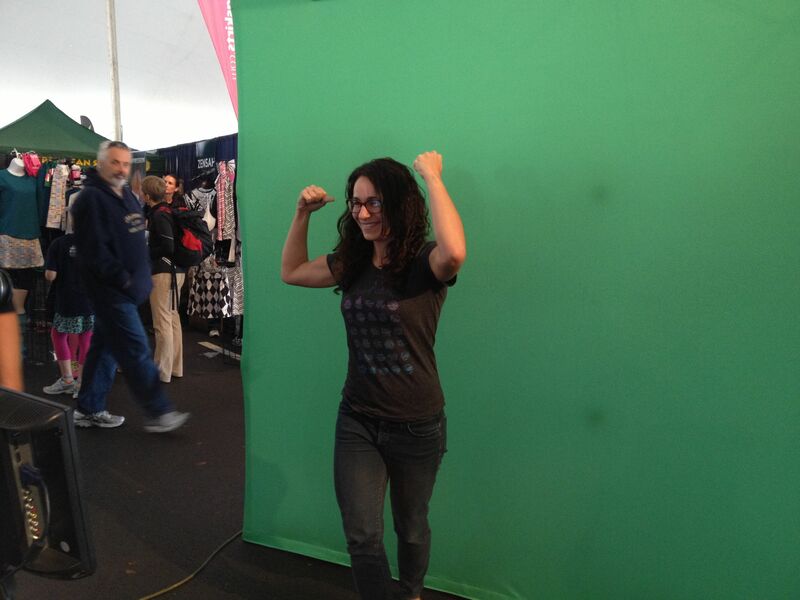 There was also a booth where you could pose in front of a green screen and get your picture imposed onto an RW cover mock-up. They printed them out on site and emailed you an electronic copy — an awesome and fun expo feature I wish other races did! There was a representative from Run Disney and we got to see the medal for the 2013 Disney World Half, which Matt and I are signed up for. Probably my favorite part was talking to a rep from NYRR. She talked to me for a while with advice for the NYC Marathon and how amazing of an experience it will be. It got me even more excited for race day. After we were done walking around the expo tent, we headed over for some book signings and seminars. I’ve never done expo seminars before, but I figured now was the time to start, with world-class speakers. We were able to sign up for sessions online in advance, which meant we didn’t have to wait in line for anything, which I appreciated. The seminars were held in the ArtsQuest building, which was absolutely beautiful. We first headed up to meet Bart Yasso, Chief Running Officer of Runner’s World and author of My Life on the Run. Matt and Jen got their books signed and Bart took some time to talk to us about the course and give some advice, and pose for a picture. He couldn’t have been nicer. He warned us about the hills and told us to reserve our legs for the second half of the race, since it trended downhill after mile seven. 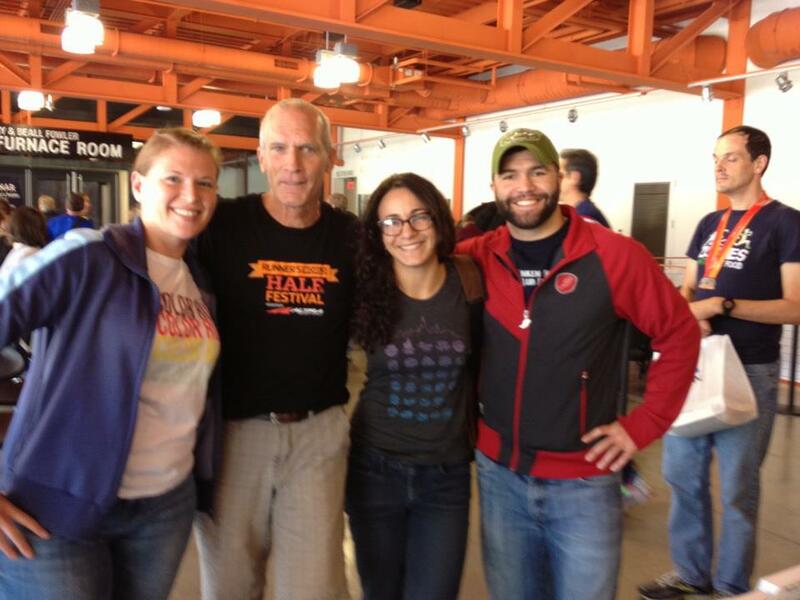 After meeting Bart, we headed into our first session on pancakes for runners! I really had no idea what to expect. I really don’t need a tutorial on how to cook pancakes, but I was hoping for a good healthy recipe I could use that didn’t have a ton of specialty ingredients. Speaker Pam Anderson, formerly of Cooks Illustrated, shared her struggles with weight and how running finally helped get her into shape. I love hearing stories like that as I can certainly relate. Then she demonstrated a good basic recipe, which I’ve posted below. And the audience got some samples! Waiters came down the rows with mini pancakes and your choice of berry or bruschetta topping. The pancakes had a solid taste and texture… certainly not as good as a butter-drenched pancake with chocolate chips, but a great healthier compromise. They worked surprisingly well with the tomato topping. I’ll definitely be making these in the future. The next session was with Bart Yasso. He gave a wonderful presentation on where running can take you. He shared stories and photos from his many travels, and talked about the feeling of community you get from running. He also shared his experience with the Comrades Marathon in South Africa, and got choked up talking about it. He highlighted all of my favorite aspects of running and definitely inspired me. After a nice pasta dinner and a night of terrible sleep, it was off to the chilly starting line. I had a hard time dressing for the day since it was pretty cold at the start, but I knew it would warm up. I went with a UA long sleeve under a tech tee, with my tights. At about mile three, I regretted the long sleeve and did my best to roll my sleeves up, but the shirt is so fitted, it’s a futile task. I debated stopping on the course to take it off, but I didn’t want to lose time. The starting village was a short walk from the parking lots. There was an assortment of beverages and snacks, and some of the cleanest port-a-potties I have ever seen at a race. They even had toilet paper and purell in them! That doesn’t seem like something worth noting, but trust me, it’s rare. There weren’t enough runners to need a wave start, but the corrals were labeled with your estimated pace, so you could try and line up according to speed. 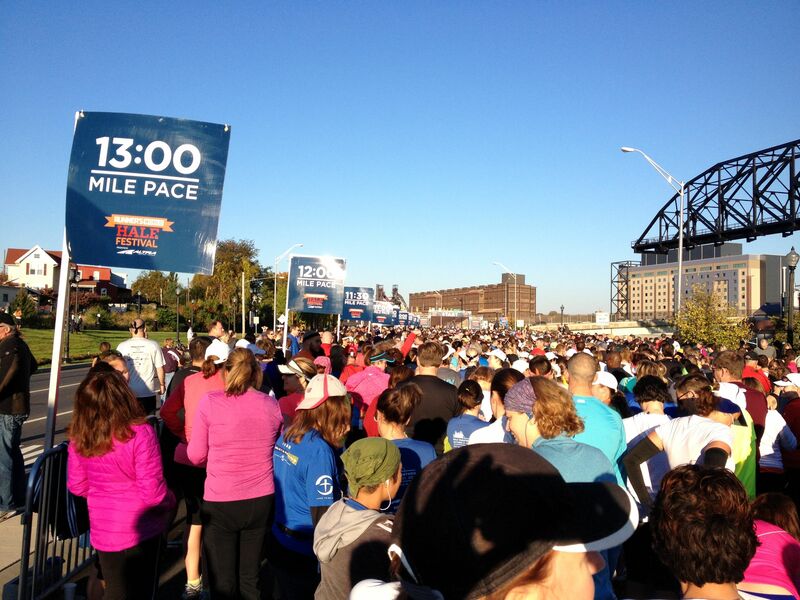 I wanted to get to the 10:00 pace area, but it was too packed. So I ended up in the 10:30 area, right by the 2:15 pace group. The course went all over Bethlehem. We covered bridges, main street, residential areas, schools, and lots and lots of hills. The leaves were all turning and because of the various elevations, there were some really great views. There were lots of water stops, with enthusiastic volunteers. And I was really surprised by the number of spectators. Lots of people just sat in their yards or driveways with signs and noisemakers. It was actually pretty touching to see. 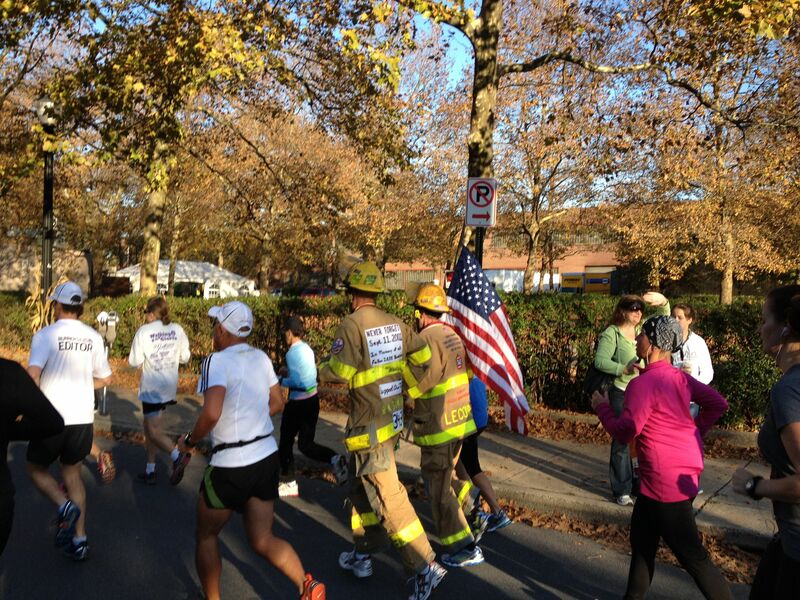 I also unintentionally ended up running alongside of two NYFD 9/11 first responders, decked out in their full fire gear and carrying a huge American flag for the first five or six miles. It was awesome to see all of the people saluting and cheering them as they passed. It was also pretty nice to pretend those people were cheering for me. 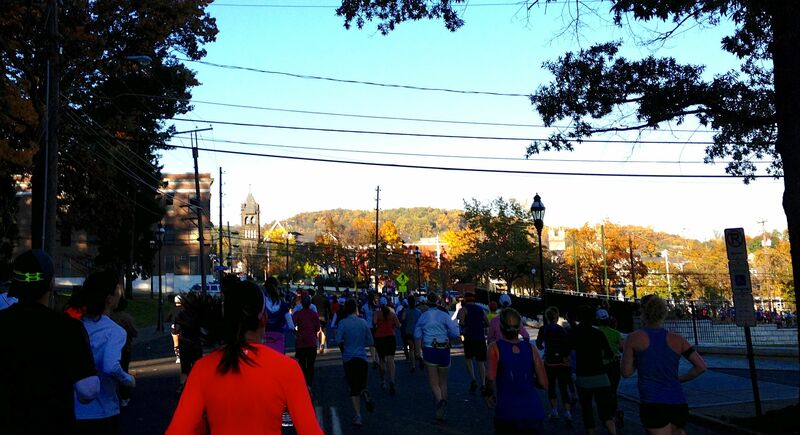 The course was definitely hilly. I am glad we were warned about that. I really wanted to come in under 2:10. I have actually only run one half marathon before that, and I was still wearing an ankle brace and had a pretty pathetic time. I knew 2:10 would be a good confidence boost going into NYC. I knew I could easily do that without hills, but I was admittedly a little worried when I started running. I slogged through the first few miles and my legs were getting tired, but I kept remembering that Bart said it would be downhill after mile seven. I got to mile seven and there was a big uphill! Bart lied! After that, there definitely were a lot of downhills. Near mile 10, I passed the 2:10 pace group and sped up, knowing I could meet my goal. As I rounded the final corner and came into the finish chute, I saw some of Matt’s friends, and then Matt and Jen. I stopped my watch and saw I had finished in 2:08:33. I felt amazingly accomplished. I feel like I am absolutely ready for NYC. I also feel like I can break 2 hours after that, once I have time to focus on speed and not distance. The bibs had a handy QR code where you could get your results immediately following the finish. My official time was 2:08:29. I love the QR feature. I also really love the medal for this race. It has the steel stacks in the background, and it’s also a bottle opener! The ribbon is also velcro so you can remove it if you actually want to put the bottle opener to use. They also had heat sheets, which were very nice since it was a bit of a walk back to the car and my sweaty shirt was making me cold. They did have shuttle buses back to the parking lot, which was very much appreciated and easy. Overall this was one of the smoothest and best-run races I’ve done. I’ll definitely be back again next year, but I’ll be signed up for the hat trick instead! Kudos to the Runner’s World team! After our post-race brunch, we walked out to Main St and discovered there was a puppy-day going on, complete with a costume contest! What a wonderful surprise. The next day, my legs definitely felt the hills in some weird places — my shins really ached. But it’s a small price to pay for a wonderful race weekend. Heat a large nonstick skillet or griddle over low heat. Mix flour, whole grains, sugar, salt, baking powder, and baking soda in a bowl. Note: White flour is included to provide fluffiness. If you don?t have all three whole grains, pick one and use the following ratios: 1:2 whole wheat to white; 1:1 oats/cornmeal to white. Microwave buttermilk and milk for 30 seconds in a 2-cup measuring cup. Whisk in eggs, oil, and vanilla. Pour wet ingredients into dry; whisk until just mixed. Return batter to measuring cup. Increase heat to medium and brush skillet with oil. When oil starts to spider, pour batter 1/4 cup at a time. When pancake bottoms are golden brown and tops start to bubble, after about 2 to 3 minutes, flip pancakes; cook until golden brown on other side. Repeat, brushing skillet or griddle with oil. Serve hot. 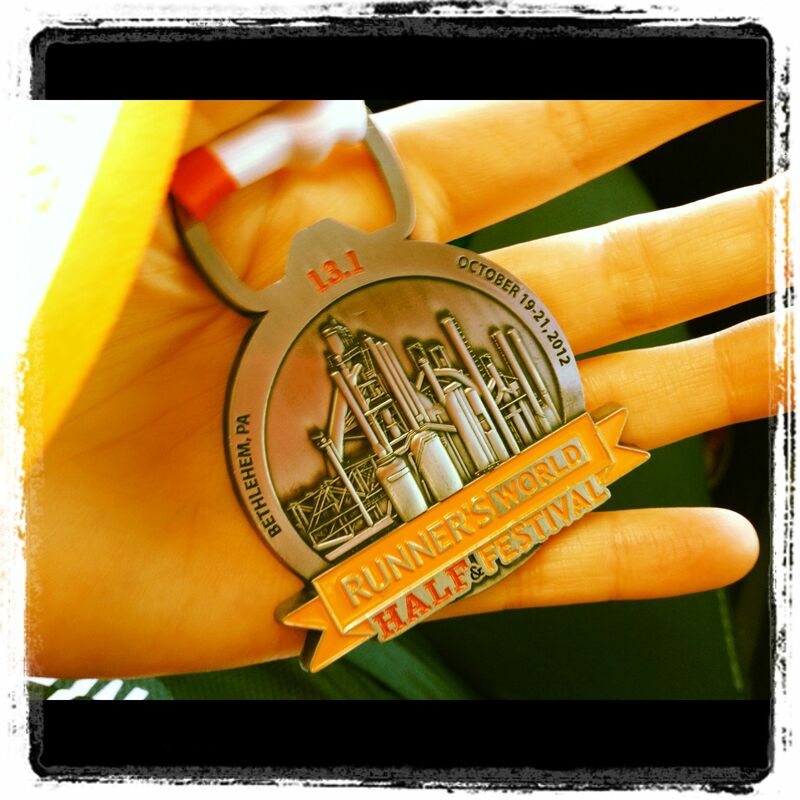 This entry was posted in Brunch, Race Recap, Recipes, Running and tagged half marathon, healthy recipe, Marathon training, pancakes, race recap, runners world, running by Jackie. Bookmark the permalink.